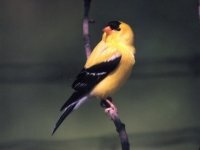 During breeding the male is bright yellow with black forehead, tail and black on the edge of the wings. The wings are barred with white. Females are much duller, as are males outside the breeding season, with some gray to olive green. Range: This bird breeds from British Columbia and Alberta to Newfoundland and south to South Carolina. Winters south to Mexico. 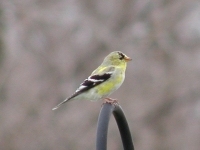 Our neighbors were attracting a multitude of Goldfinches with their thistle feeders. 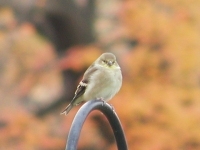 Once in a while a Goldfinch would stop by our feeders for a change of pace or take a dip in our birdbaths. We finally broke down and put up a thistle feeder too. Can't let the neighbors have all the fun. 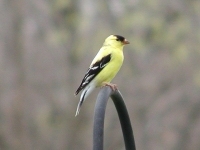 Besides we're lucky to have more Goldfinches around than Sparrows most of the time. We've been very entertained on several occasions watching these guys chase each other around the yard and through the trees. Their feeder wars can also be quite humerous. During breeding season the males are easy to spot from a long distance. The bright yellow certainly makes them stand out in a crowd. 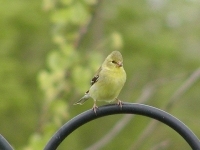 If you decide to hang up a feeder to attract the American Goldfinch, please buy a good one. We tried a couple of very inexpensive tube feeders that were supposedly for all kinds of seed. We quickly found out that the seed, especially the thistle seed, just ended up pouring out of them and onto the ground.